Holders Arsenal Ladies will travel to fellow top-flight side Reading in the first round of the Women's Continental Cup, which has a new knockout format. 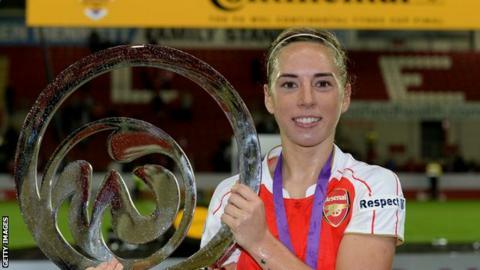 The cup - won by Arsenal for the fourth time in its five-year history in 2015 - involves all 19 sides from Women's Super League One and Two. The six lowest-ranked sides from 2015 were drawn into a preliminary round. All eight of last season's WSL 1 sides move straight to the first round, and were deliberately drawn away from home. Manchester City, the 2014 winners, are away to WSL 2 outfit Aston Villa in the first round, while Everton will host Liverpool in a Merseyside derby. The preliminary round will take place over the weekend of Saturday 7 May and the first round is scheduled for Saturday 2 July and Sunday 3 July.